Discussion in 'Article Discussion' started by Tim S, 6 Dec 2007. I expected more out of Abit than a pretty board. What went wrong? With the BIOS holding back memory performance that much, wouldn't it be a rather mediocre, rather than awesome, one? The usual thorough Bit-tech review. Can you say which BIOS version that you tested with? Obviously it's early days in BIOS development for this board & improvements are expected over time. Your experience with Vcore is interesting as it goes against what most others have been reporting in places like XS etc. - there people are reporting only ~0.04V Vdroop even with a quad which is obviously significantly different from your results. I wonder if that's due to a different BIOS? & there are certainly some people who are looking at buying the QuadGT specifically because it has a x4 slot for a RAID card etc. At the end of the day it's a design choice & whether it's right or wrong for you is upto you to decide. I totally agree about P35 still being a very strong competitor if you don't need the 2nd X16 slot to run Crossfire which is why I'm sticking with my IP35 Pro. Richard listed BIOS 11 on the test setup page, which is the latest available on Abit's site. I'm guessing there will be more updates in the long run that will improve performance over time... I don't personally think it's a bad board, but it's one that you're only likely to be interested in if you want CrossFire. Must have missed that, they're already on 12beta3 so that's probably the difference then. I totally agree about Crossfire being the only reason for going X38 & probably X48 too. Quite likely a different BIOS, or perhaps the reporting of it? What are they using? Or because I was using a 45nm CPU which has a different power requirement. Got any links? I totally agree that if it has the features you want, it's a great board, but when I invest in something I expect it to perform at least a little better than a previous generation product. I don't like it being at the sacrifice of a PCI-Express GbE though. Doesn't X38 pretty much fall foul of that in general though? Other than the 2nd PCI-E x16 slot there is no compelling reason for anybody to go with it over P35 as far as I can see. Personally the PCI LAN doesn't bother me as it's still faster than any single HDD can deal with & it's 10s of time faster than domestic Broadband. Mind you the x4 slot doesn't bother me either (unless perhaps for a physics card if that proves to be genuinely useful). It's not faster than hard drive. 100Mbit = 8MByte per sec and "PCI" Gigabit is a fair bit slower than PCIe from what I've read. It's better for LAN gaming too - as long as you have a good Gigabit switch to connect to. The Abit doesn't offer a teaming function everyone else does either, only having a single LAN. It is about a million times faster than broadband, but like you say, how many people use an x4 either. The two x16 Gen-2 are actually worth having now because of the price erformance of HD38s, but if you don't care about that then it's cheaper P35 all the way. why dont you do some Amd boards for a change? Nice review. If it was a third less in price it would be worth having but it's just too expensive for what it is. I was hoping for much more. A step back from abit. Shame. Our last motherboard review was an AMD board and there are more in the pipe, but they don't just happen overnight. Is that because poor old Rich tends to do alot/all of them ...nice review though. There is one gripe, there was a mention of the inability to use the sata clips on asus boards, now maybe i've been silly and used them but all six on my p5n32-e sli have the clips mention and the onbaord ports and all at 90 degrees to the board, just like on the abit reviewed. Using the Asus 90 degree SATA sockets you have to force in so it bends the plastic out - there are no little gaps like the Abit 90 degree SATA connectors. Great review Richard , many points I agree with. Like you I was surprised at the sparseness of the package. 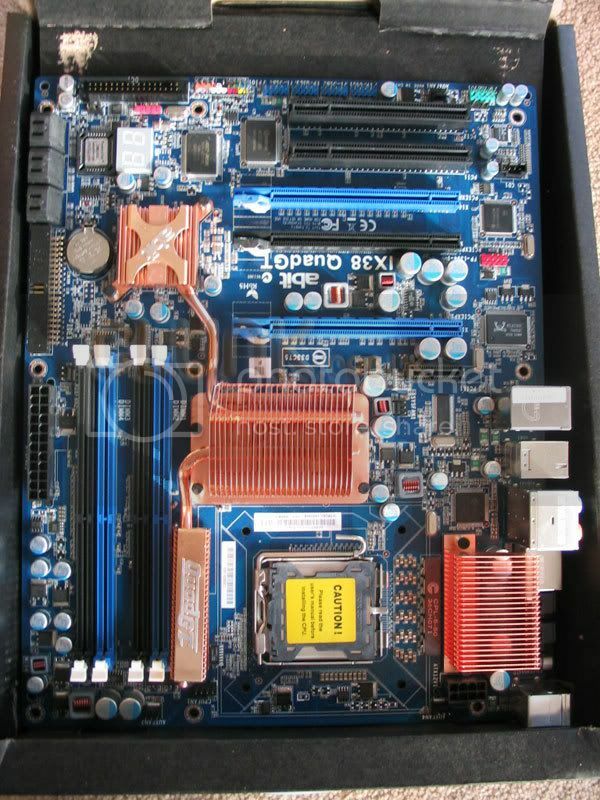 I'm not sure about yours but the box / mobo tray is also too big by about 2cm, leaving a mobo that slides up & down the box, which isn't to impressive. The other thing is the lack of fan retension clips for the NB & PWM, despite being shown in the manual. It's good to know there's another resource out there with details, as well as a beta community still. It's not faster than hard drive. 100Mbit = 8MByte per sec and "PCI" Gigabit is a fair bit slower than PCIe from what I've read. It's about 735Mb/s which is 91MB/s - even a Raptor won't do that for continuous transfer & most other HDDs will be ~50-60MB/s. The Abit doesn't offer a teaming function everyone else does either, only having a single LAN. daft question - assuming that you have PCI-E Gigabit LAN & a Gigabit switch, how does teaming help you as the switch surely is the limiting factor i.e. you can't get 2 pints into a 1 pint glass? From a layout point of view, that is possibly the best thought out board I have ever come across. It does seem let down in other areas, but definitely not layout. I wonder when Bit-tech will review the DFI LanParty UT P35-T2R motherboard? Abit's layouts are always awesome IMHO and this is no exception!